King Tupou VI of the Kingdom of Tonga addresses the seventy-third session of the United Nations General Assembly. Ensuring Sustainable development and surmounting the ‘devastating impacts’ of climate change were on the top of the agenda at the United Nations General Assembly on Wednesday, where King Tupou VI of Tonga was joined by a host of other Pacific Island leaders calling for action on what they saw as “the defining issue of our time”. “In contributing towards the implementation of the 2030 Agenda for Sustainable Development and its landmark Goals (SDGs), including the internationally agreed blueprint for the sustainable development of small island developing States (SIDS), the SAMOA Pathway, Tonga has made both accords an integral part of its national planning processes,” he said on Wednesday. 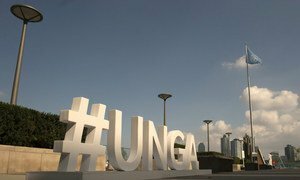 He emphasized the importance of the UN High-Level Political Forum (HLPF) on Sustainable Development, which he pointed out will review the SAMOA Pathway in 2019. He stressed that despite the effects of sea level rise, Tonga’s territorial boundaries, established under the UN Convention of the Law of the Sea, should remain unchanged. “Our Sovereignty must not be compromised by climate change and we welcome the work of the International Law Commission on this critically important and timely issue for consideration of the Sixth Committee of the General Assembly,” he said, referring to the Assembly’s standing body that deals with legal issues. He was looking forward to the 24th Session of the UN Framework Convention on Climate Change (UNFCCC) in December to address the adverse impacts of climate change and the need for innovation in adaptation for small island developing States. 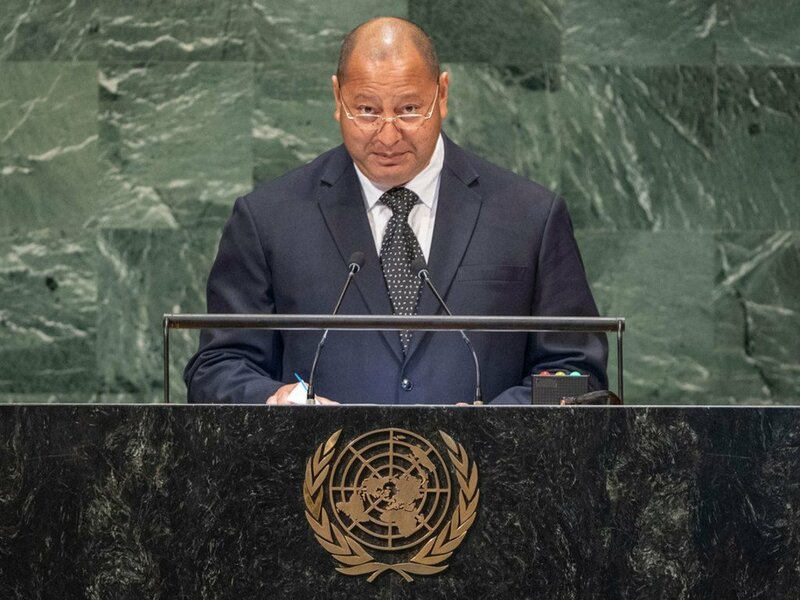 “We continue to look to the Security Council to protect the innocent from threats to international peace and security in whatever form, be they traditional threats such as armed conflict, or newer threats like climate change, to ensure no one is left behind,” concluded King Tupou VI. “It has the potential to become the most powerful source of marine life enrichment and provides solutions for many of the problems facing humanity,” which the 2030 Agenda for Sustainable Development is addressing, he said. Underscoring Kiribati’s strong commitment to implement the Sustainable Development Goals (SDG), he noted that “by closing off the area to commercial fishing, we have sacrificed a substantial amount of income from fishing licenses every year, estimated at about 10 per cent of our annual fishing revenue,” averaging $10 million annually. Meanwhile, Baron Divavesi Waqa, President of Nauru, linked climate change to the country’s economic well-being, stating that while consumption-based economic growth has “destroyed the health of our oceans and the safety of our climate,” a liberalized global financial system has diminished opportunities for small domestic enterprises, rendering small island developing States to score extremely high on economic vulnerability indexes. Citing the havoc wreaked on the Philippines from Super Typhoon Mangkhut, he called an “urgent global priority” the importance of building the resilience of vulnerable countries to climate change impacts. President Remengesau shared Palau’s Climate Change Policy Framework to prepare and minimize disaster risks and mitigate climate change by working towards low carbon emission through clean energy initiatives as it continues to work with partners in building capacity and mainstreaming climate change into its national planning and budgeting process.